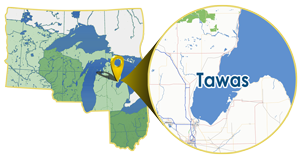 Tawas Bay and the surrounding areas offer a multitude of fishing adventures. Tawas Bay Fishing has year-round opportunities, no matter the season or the type gear you have. Fish from the shore, riverbanks, the dock, your own boat or hire a fishing charter service. Discover your new favorite getaway. Steelhead fishing on the lower Ausable River has been good for the last week. Great river flow and water temps around 40 degrees has energized these chrome brutes. Fish are spread from Foote dam to the river mouth. Focus on the deep runs. Hot shotting with Wiggle Wart and Willy Worms working best. Gold and orange and the pirate pattern working best. Drifting spawn bag also working well. Picture below is 15yr old Amber Heiser with her first steelhead. Fish was 7 pounds. Spring is officially here and steelhead fishing on the lower Ausable River is heating up. Drifting bobbers and spawn bags , plugging with wiggle warts have boated many steelies this week. Focus on the deep runs. Once the water temp warms up a few more degrees the spring run will be heading in. Drift boat charter dates still available. Steelhead fishing on the lower Ausable has remained good. Once against ice flows limited access to some parts of the river. Drift fishing bobbers with spawn sacks and hot shotting plugs are producing some great catches. Gold and orange wiggles warts been working best. Still has some driftboat charter dates available for late March and April. Fishing on the lower AuSable River has been very good A mix of steelhead and Atlantic salmon being caught casting #3 Blue fox spinners and hot shotting with wiggle warts focusing on the deep runs. After the horrible north east blow two weeks ago, water temps have leveled out and fishing is quite good. A few kings have been taken long lining plugs at the Ausable river mouth. Off shore for lakers, steelhead and salmon in 95-120ft of water using spoons. Dodger spin n glo still working well just off bottom. Spite the wind and rain fishing has remained very good. A few chinooks have been taken off the river mouth and offshore fishing has been a mixed bag of lakers steelhead, walleye and salmon. Fishing 85-110 ft. Leadcore with glow green spoons and riggers just off bottom with spin n glow dodgers and small spoons. For charter info contact Capt Gene at Calypso Charters 989-739-2313 , calypsocharters@yahoo.com. Spite the extreme heat and a couple windy day , the offshore fishing has been very good. Limits of lake trout with a few steelhead, salmon and walleye in the mix being common. Fishing 5 1/2-6 miles offshore, 85-100 ft of water. Dodger spin n glows and spoons of the riggers working best just off bottom. Offshore fishing has continued being good to excellent. Daily limits of lake trout with a few steelies and Atlantic salmon are common. Fishing 85-120 foot of water using dodger spin and glow just off bottom and small spoons of the riggers. Lead core line 120’-450’ with spoons are catching a mixed bag. Offshore fishing spite some crazy weather has been very good. Daily limits of lakers with a mix of steelies and Atlantic salmon are common. Fishing 5-6 miles offshore, 85-110 foot of water just off bottom with dodger spin n glows and small spoons. Fishing lower Ausable river for walleye has slowed done lately. A few are still being caugh drifting crawler harnesses early morning and just after dark. Offshore fishing has been excellent for lakers with an occasional Atlantic salmon and steelhead. Fishing 85-100 ft of water just off bottom. Spoons and dodger spin n glows working best. Leadcore 450-600 ft also taking fish. Walleye fishing on the lower Ausable has slowed down. Drifting crawler harness working best early morning and right at dark. Offshore fishing has been excellent in 60-80 ft of water. Trolling with dodgers and spin n glows a foot off bottom working best. Lead core 150-500’ with spoons has been catching steelhead, Atlantic salmon and lakers. Walleye fishing on the lower Ausable below the us-23 bridge is still good early morning drifting crawler harness. For current conditions or charter info contact Capt. Gene Kirvan at Calypso Charters 989-739-2313 or calypsocharters@yahoo.com. The steelhead run on the Ausable is in its final stages Many great catches can still be had. Pulling plugs through the deep runs to floating spawn in the gravel. Many of these brutes can still be caught. Walleye fishing by the pier heads at sunrise or just after dusk has been producing a few good catches. Casting rapalas working best. For current fishing info or charter info contact Capt. Gene at Calypso Charters 989-739-2313. Fishing on the lower Ausable has been good Some huge Steele’s have been caught this last week. Hot shotting plugs working well. For more info contact Capt Gene at Calypso Charters 989-739-2313 . DONT MIND THE HORIZONTAL IMAGE LOL couldn't get it to flip to save my life, but hey you all get the point. The steelhead fish has been very good on the lower Ausable river. Hot shotting with gold and orange wiggle warts has been pounding many great steelhead. Focus on the deep runs This is the big steelhead of the week. Alyssa Deleski with her first steelhead. This hen weighed 11 1/2 pounds. For a current fishing report Contact Gene Kirvan at Calypso charter fishing for a great time. 989-739-2313. Lake trout and walleye were caught around the artificial reef in northern Tawas Bay. Jigging spoons tipped with a minnow head has been the ticket. 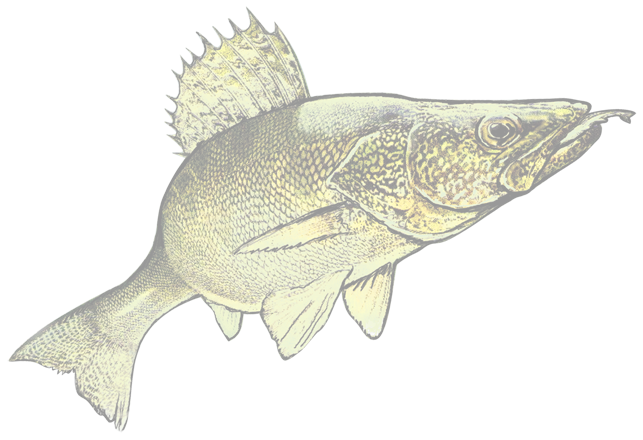 Perch are being caught on the edges, in 15 to 20 feet in the same general areas. The cold weather has helped but still be very careful. The river fishing has been a little tough with the colder temps but fish are still being caught. Just a few nice days in a row should really help. Today's steelhead catch on the lower Ausable river. Hot shotting with wiggle warts. Fishing offshore from Tawas north to Oscoda has been good, with the bulk of the catch being lake trout with some chinook salmon and steelhead. Trolling 1.8-2.0 over 100-130' of water fishing off bottom with dodgers and spin n glows. Salmon being caught at the 50 degree temperature break using magnum spoons. 10 color lead core with mag spoons have been catching a mixed bag. The walleye bite for those fishing around the Charity Islands has been very good. Crawler harnesses fished on bottom bouncers have been the best. Watch for the fish to suspend later in the day as you may want to fish the bouncers in the mid depth off of in line Off Shore trolling boards. Those targeting Trout and salmon have had success in 55-75' try fishing some of the lines Higher up as many Steelhead and Atlantics are also being boated. Spoons and fly/dodger set ups are working for the hi fish. The walleye fishing has been getting better around the Charity Islands. The north side in shallow water (10-20') seems to be holding fish. Crawlers and spinners have been working. The spring steelhead run is nearing the end of the season. A few nice steelies have been caught just off the AuSable river pier heads trolling body baits. Walleye fishing at the river mouth has been heating up. Early morning at sunrise and just after sunset. Jigging with soft plastics working best. Lakers are being caught offshore in 50-60 foot of water trolling spoons. Look at these nice ones from the shorelines from last week! The waters around Tawas are starting to produce a mixed bag for those trolling the shallower waters from Tawas and to the south. Shallow diving stick baits are catching walleye and a few browns and atlantic salmon. This mixed bag is what makes Tawas special. You don't need to go far from shore as all the action right now is under 30'. The river is still kicking out a few nice steelhead but the run is basically over. Just waiting on the perch to start in the harbor. Really good reports are starting to come from the lower AuSable river. The steelhead fishing has been excellent! Hot shotting with Gold/Black and Pirate pattern wiggle warts has been the most popular trolling technique well the bobber fishing and spawn has been working well for the "rod in hand" guys. This bite should be very strong for a good month. Look at these beautiful fish landed by Gene Kirvan and his customers over the past few days. Weather is going to be great, so get out there! We are seeing fish in the rivers all around the Tawas area. The ice is done for the season and we are just waiting for the start of Walleye trolling and perch fishing to fire up. I'll be reporting again in mid April after a walleye trip! Stay off any lakes now as the ice is treacherous. Open water Perch and Walleye fishing will be here before you know it! The river steelhead fishing should be fantastic now. The pan fishing on Tawas lake has been great with lots of decent sized gills being iced. The fishing on the bay has been relegated to the north end and the ice there is still not the best. We will update as soon as we get a good report. Tawas Bay has had anglers fishing for Walleye and Perch out in front of Jerry's Marina. The bite has been hit or miss but the fish that are being caught are of good size.